In his new book, The Undercover Edge: Find Your Hidden Strengths, Learn to Adapt, and Build the Confidence to Win Life’s Game (Available January 9, 2018), Derrick shares his personal mindset regarding human behavior and motivation. He also provides tips on how readers can apply investigative tactics to adapt to their surroundings and succeed at work and home. Whether you are a college student looking to improve your interpersonal skills, a manager seeking a new strategy to motivate your staff, or just someone wanting to increase their social awareness, The Undercover Edge will help you build a solid foundation of confidence to become a stronger, more capable communicator in all areas of your life. WHAT PEOPLE ARE SAYING ABOUT "THE UNDERCOVER EDGE"
"Derrick Levasseur first entered the world of crimefighting and now channels years on the street into his new "how-to" book on communicating more effectively, leading with confidence, and battling life's obstacles head-on! Incredible!" "Levasseur gives readers an incredibly insightful way to identify and achieve their goals in The Undercover Edge. Not only is his writing style engaging and illuminating, it is fundamentally practical and easy to understand. So easy, everyone can apply his ideas in their everyday lives or business ventures. When I read it, I was amazed at how Levasseur instinctively developed skills it took me decades to learn and hone as an FBI Profiler. The Undercover Edge is pure GENIUS!" "Derrick Levasseur walks the reader through his law enforcement career and highlights tips and techniques that can be used by everyday people to gain new insights into social and business encounters. His conversational writing style makes the book easy to read and understand." "For anyone who, like me, watched Derrick deftly maneuver his way to the grand prize on Big Brother and asked in amazement, 'How did he do that?!' -- This book is the answer. From visualization to knowing your target to developing your intuition, Derrick breaks down a clear, practical, effective strategy for achieving your own goals in life. 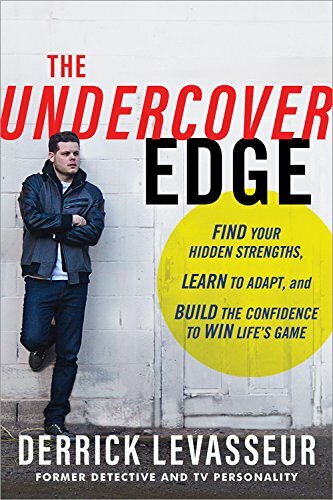 As entertaining and clever as his Big Brother run, The Undercover Edge will inspire you, motivate you, and put you directly on the path to becoming the person you want to be." "Derrick has demystified and unraveled life secrets of practiced professionals with pragmatic and effective strategies that underlie successful investigations, interviews, work success, and personal relationships. The Undercover Edge is a must-read for anyone who wants to fully live their life and maximize their unlocked potential." "Derrick's adaptation of undercover techniques for business applications is innovative but practical. Whether you're an entry-level employee looking to build stronger relationships with clients and colleagues or a CEO seeking new ways to understand and communicate with your team, The Undercover Edge offers an approach that will assist you in leading more effectively and achieving your professional goals."